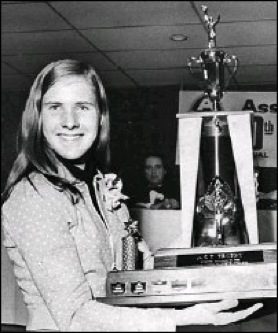 Glenda Reiser ran 4:06.71 for 1500m at the 1972 Olympic Games; and was the Canadian native and open record holder. Her time is still the Ontario Youth U17, U18; Junior U19, U20 and Espoir record. Her Ontario Mile record at 4:35.13 set in 1973 is also still on the books. At the 1974 Commonwealth Games, Glenda won the gold medal in the 1500m. She competed in the inaugural women’s 1500 metre Olympic event at the 1972 Summer Olympics in Munich, where she finished second in her heat with a time of 4:06.7 to Lyudmila Bragina who broke the world record. Reiser’s time was a World Junior Record. She was then eliminated in the semifinals. On September 15, 1973 Glenda broke the world record for the women’s mile with a time of 4:34.9. At the summer Universiade held in Moscow in 1973, Glenda took home a silver medal in the 1500 metres. She also took a silver medal in the 1500 metres, and a bronze medal in the 800 metres at 1973 Pacific Conference Games in Toronto; where she had a tight finish with Mary Decker (USA) and Charlene Rendina (Aus), in which all 3 medalist finished within 1/10 of a second of one other. She was the three time Canadian 1500-metre champion and won a gold medal at the distance at the 1974 Commonwealth Games in Christchurch, New Zealand breaking the games record twice along the way. She was inducted into the Ottawa Sports Hall of Fame in 1988.